I’m a woman and a mom. I also have this obsession with doing my nails, as a lot of other women do. I’m also a author! So, since I have books and love to do my nails… I’m going to do a Mother’s Day Giveaway to make it easy for you to win something to give your awesome wife, mother, or yourself for Mother’s Day just by reading and reviewing my books! And, yes, it has to to with nails. I will be giving away Jamberry Nail wraps to one lucky winner who leaves honest reviews for my books (anthologies with my story in them count, but you have to mention my story in the review)! The prize will consist of two full manicures, six pedicures, and eight accent nails from my own personal stash (approx. a $30 value). 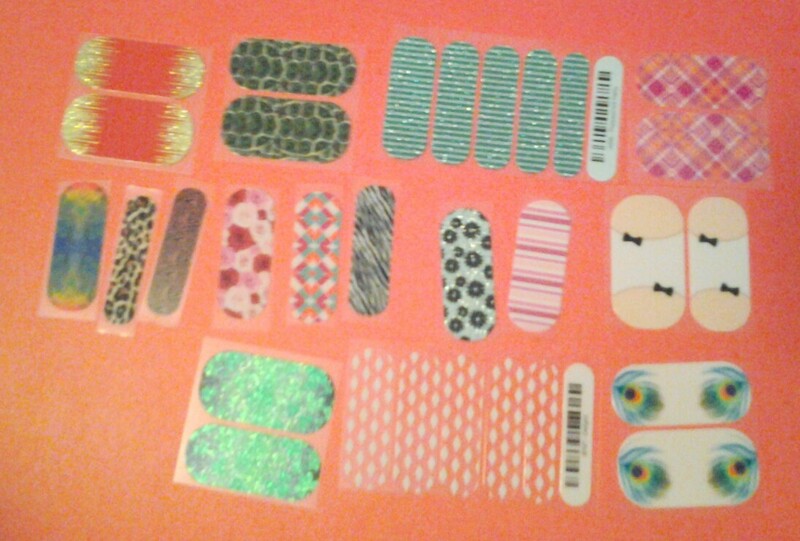 The wraps given away will be the ones in the pic below (no substitutions – I took the photo on a colored background so that you could see that some of the wraps are clear with designs, meant to be worn over polish or solids). How do you enter? Leave a review on Your Blog, Amazon, Barnes & Noble, or Goodreads for one (or more – each book reviewed counts as an entry, so you can enter to win multiple times) of my books from April 1st through April 20th, 2015 and post a direct link to the review in the comments of this blog post! On April 21st, I will choose a winner (randomly) and contact them for their address so I can get the prize sent out in time for them to present it as a Mother’s Day gift. Need a quick way to find my books so you can purchase and review them? Find all you need to know on my Amazon Author Page! **Official rules: You must post a direct link to your review(s) in the comments of this blog post to be entered in the giveaway for the prize. Entries attempted through Twitter, Facebook, or any other point of contact WILL NOT COUNT. Reviews must be posted and dated between April 1-April 20, 2015. No reviews on other dates will be accepted. Only one review per book counts (you can’t post the same review on Amazon, Your Blog, B&N, and Goodreads and expect four entries). Only reviews for different titles will qualify as multiple entries. Check back on April 21st to see if you are the winner. I will attempt to contact the winner from the information from comments here, but if for some reason I am unable to reach the winner, the winner is responsible for contacting me to claim their prize. If contact can’t be made and I am not contacted by the winner by April 27th, 2015, I will choose a new winner. If that winner is not contacted/communicated with, the prize will become void and no one wins. I am not responsible for prizes lost in the mail. I will send to the address I am given by the winner ASAP. No cash prize can be substituted for the Jamberry Nail wrap prize. No exchanges will be made for the wraps. Marketing is depressing. Most of the time authors work very hard at getting the word out about their books, yet there is no movement in sales. This leads to feeling like you’re talking to a brick wall, or are just invisible. Neither is really the case, we just want to see something for our efforts that might not come for a while. How often do you go buy a book as soon as you hear about it? Not often, right? Unless it’s an author you’re familiar with (and love) and have been waiting for their new book to come out. Books cost money, as does everything else in life. There are house payments/rent, utility bills, clothes, school, gas, groceries, etc. that people need to live. Those things come before books in the real world. There are few people who have a “book budget” – money set aside just to purchase books. But, most people have lists of books they want. Your book might make it to that list, but there might be twenty titles ahead of yours. They will probably buy your book when they can in a few months. Ebooks make the cost of reading a little bit easier on the average person who enjoys reading. They can get more books faster, because it doesn’t cost them as much to acquire them. So, having a few cheap titles for sale as ebooks can help build your readership fan base, and that’s what we all really need to do. See in paragraph two where I said about waiting eagerly for a new book to come out from an author you love? That’s what we all need to do. We need to become authors that are loved. We need to put out good books and build fan bases of people who will look forward to buying our titles when they come out. No, building a fan base isn’t easier than any other type of marketing. Often, it’s harder, especially for indie authors. You have to spend time on social media, being active and “seen.” You have to talk to and respond to your fans and do giveaways, etc. Think of building a fan base as personal marketing. It won’t be about flashing links and covers at people. It will be sharing with people who have the same interests and hopefully building friendships that make people want to read your books because they connect to you on some level. That’s how fan bases start. As time goes on and your fan base/readership grows, you might not have as much time for those personal connections, but they will have a major impact starting out. And if you do have time to spend with your fans when your name is bigger and you’re reaching more people, it will mean even more to people you take the time to talk to. A word of caution… People don’t like people who are rude assholes, so don’t be one of those snobby authors who are dicks to your readers. That will lose you more than just that one reader you were rude to, it will lose you any possible new reader who saw it on social media, or heard about it from other people. You can easily lose fans, and potential fans, by having the wrong kind of attitude. Become an author readers will love and create works they want to read. Be more than just a book pusher.